The winner will be selected tomorrow afternoon. In early December, we gave you a heads up about an autographed "Cool Grey" Retro 11 contest being held by the Charlotte Bobcats' Facebook team. After weeks of wondering exactly when the contest would end, the 'Cats have announced that a winner will be selected tomorrow at 2:30 p.m. EST. 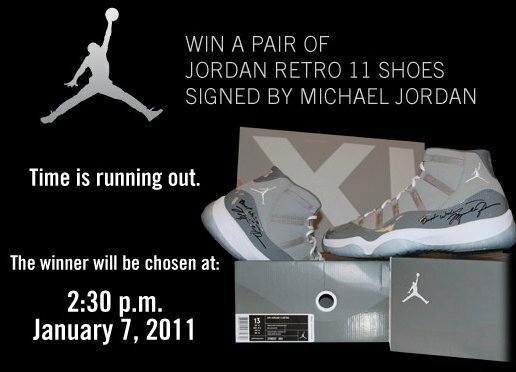 The individual selected will of course win a pair of the popular retro sneakers signed by Bobcats Owner Michael Jordan. Kicks come in MJ's size 13. There's still time left to enter. Just head over to the Bobcats' Facebook page, 'Like' the Bobcats and fill out the form under the Signed Jordans tab.